Roan Mills is the first farmer/miller/baker/pasta maker in California. 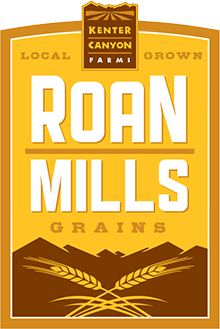 Created by Kenter Canyon Farms to showcase their grain program, Roan Mills introduced identity preserved, heritage wheat varieties in 2013. Fifty acres of fertile ground were planted to Sonora, Glenn and Red Fife wheat varieties in November of 2012. The crop was irrigated only with seasonal winter rains and the wheat thrived. We ended up harvesting 80,000 pounds of wheat in June of 2013. The varieties were harvested, cleaned and stored individually. Using our 20” Meadows stone mills we mill these wheat varietals into flours and porridge. We use the fresh, whole grain flour to bake rustic, sour dough breads for our local farmers markets. We also make Identity preserved rustic dry pastas and are launching a line of fresh pastas this summer.